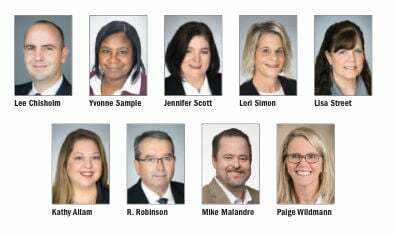 Taylor Bank announces the promotions of seven employees: Lee Chisholm, Yvonne Sample, Jennifer Scott, Lori Simon, Lisa Street, Kathy Allam and Raymond Robinson. Chisholm has been promoted to vice president, Loan and Business development officer. He began his employment in March of 2006 as a teller at 20th Street branch. He later became branch manager of Snow Hill and then became a loan officer. Sample has been promoted to operations supervisor of the Electronic Services Department. She began employment in May of 2001 where she started in the proof department, now evolved into electronic services. Scott has been promoted to assistant vice president, branch manager and IRA and HSA administrator. Scott began employment in September of 2013 and manages branch operations at main office. Simon has been promoted to vice president, branch manager and CRA officer. Simon began employment in January of 2006 and manages the bank’s newer location at Ocean Landing. Street has been promoted to senior loan processor. Street began employment in September of 2015 in loan operations. Allam has been promoted to director of Information Technology and Security. Allam began employment in November of 2008 where she started in branch operations and then later completed the management trainee program and was promoted to manage the IT and Electronic Services departments. Robinson has been promoted to senior vice president of branch operations. Robinson was rehired in August of 2003 where he served as a branch manager and continues to serve in a leadership role in branch operations. The Choptank Electric Cooperative Board of Directors has selected Mike Malandro as the next president and CEO of Choptank Electric Cooperative. He will succeed President and CEO Mike Wheatley, who will retire March 31, after 25 years of dedicated service to the Cooperative. Malandro has served as president and CEO of Prince George Electric Cooperative in Waverly, Virginia for the last four years, while also leading the cooperative’s broadband business, “Ruralband” for the last two years. The broadband project has been recognized throughout the nation and state as an innovative approach to a rural broadband solution. Malandro’s ability to work with local governments and utilize partnerships with local nonprofits, state and local governments to strengthen economic prosperity for rural Virginia has been highly popular with Co-op members and leaders alike. He has demonstrated leadership and supports regionalism to spur employment and capital investment within the communities the Co-op serves. Malandro is a professional engineer licensed in the states of Virginia and Maryland. He holds a B.S. in electrical engineering from West Virginia University, and completed NRECA’s prestigious Robert I. Kabat Management program. He is a veteran of the U.S. Army and West Virginia National Guard. In addition, Malandro currently serves as director on numerous organization boards including, the National Rural Telecommunications Cooperative, Old Dominion Electric Cooperative, Virginia Maryland Delaware Association of Electric Cooperatives, Virginia Gateway Region EDO, and Girls Scouts of the Commonwealth of Virginia. Paige Wildmann, certified registered nurse practitioner, has joined the medical staff at the John H. “Jack” Burbage, Jr. Regional Cancer Care Center in Berlin. She will be providing comprehensive care to patients in conjunction with Drs. Rabindra Paul and Roopa Gupta. She will also help coordinate care plans with patients and provide patient, staff and caregiver education. Wildmann has 16 years as a CRNP and over 11 years of experience in cancer care. She is certified by the American Nurses Credentialing Center, the Oncology Nursing Certification Corporation and the American Association of Nurse Practitioners. She earned her bachelor of science in nursing from Salisbury University and her master of science in nursing from Wilmington University. Her office at the Burbage Center can be reached at 410-629-6888.